Free Shipping! Exclusively for our retail customers, receive free curbside delivery in the lower 48 states for a limited time. Simply add to your cart and checkout. CellarPro 1800XTS-B Beer Cooling Unit (P/N 2176). 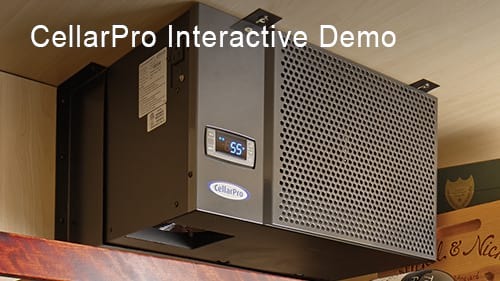 CellarPro's 1800XTS-B cooling unit has been optimized to provide maximum cooling power and adjustable humidity control for storing and aging beer collections. Optimal beer storage conditions require steady temperatures around 45°F and relative humidity between 45 and 60 percent. Our 1800XTS-B beer refrigeration system includes a 1/2-inch condensate drain line and 100W heating element to burn off excess condensate, and an extra defrost sensor to prevent ice buildup. On the hot side, this unit intakes from the rear, and offers a choice of top or rear hot exhaust. The 1800XTS-B requires fresh air intake at the rear of the cooling unit. If sufficient space does not exist to provide sufficient airflow to the rear of the cooling unit, you may need a rear duct kit. 1800 Series cooling units can be installed completely inside the wine cellar when used with our rear duct kit, which allows you to duct the supply and return airflows from the rear of the cooling unit up to 100 equivalent feet (50 feet per duct). Please note: The cold side of the 1800 Series cooling units cannot be ducted, and the hot side can be ducted with 6-inch ducting (no reductions) plus auxiliary fan support, which is included with our our rear duct kit. You must located this unit within the cellar, with the following exception: these units can be installed directly above the wine cellar when used with our front intake hood. For installation in environments below 40F, our compressor heater modification is required. For installation in environments below 20F down to -20F, we recommend our Fan-Cycling Switch (P/N 6972) combined with our compressor heater. CellarPro 1800XTS-B Cooling Unit (P/N 2176). CellarPro's 1800XTS-B cooling unit is engineered to provide advanced cooling power and adjustable humdity control for ideal beer storage. 1800XTS-B units use powerful compressors and oversized coils to generate maximum BTUH without stripping moisture from the environment. All air-cooled refrigeration equipment requires fresh air intake to dissipate the heat generated by the cooling unit. The fresh air intake CANNOT come from the wine cellar space - it must come from space outside the cellar. Designed for indoor use only, 1800XTS-B units can operate in environments ranging from 95F to 40F out of the box. To operate the unit in colder temperatures, please see modifications listed on the Options & Upgrades tab. *Assuming R19 insulation throughout the cellar, 55F inside the cellar and 85F outside the cellar. This unit offers a choice of top or rear hot exhaust. If the unit's location does not provide sufficient room for airflow, you may need to purchase a rear duct kit. Extra-large coils generate maximum cooling power. 100W Heating Element and 1/2-Inch ID Drain Line are included as standard equipment to burn off and channel excess condensation. Intuitive LED display panel mounted on the evaporator with digital programmable thermostat is simple and easy to use. Remote thermostat is available as an upgrade. Temperature set point range is 40F to 62F when the cooling unit is properly sized. Audible and visual alarms and maintenance-needed indicator protect the cooling unit and the wine cellar. 10-foot power cord exits from the rear and plugs into standard 110V receptacles. Common dedicated 15-amp circuit is required to power the unit. 3-amp electric receptacle is provided to run a small lamp. Removable steel case provides access to the internal components for servicing and repair. CellarPro's 2-Year Standard Warranty, the most thorough in the industry, protects the unit against manufacturing defects. Compressor Heater #1727: protects the unit when installed in environments that drop down to 20F. Fan Cycling Switch #6972: supports the unit in temperatures below 20F and as low as -20F when combined with our compressor heater. Duct Intake Hood (Cold Side) #1932: permits the cooling unit to be placed directly above the cellar. Duct Hood (Hot Side) #7409: allows you to install the unit completely inside your cellar or in a small space with limited airflow. Includes an auxiliary fan, but no ducting. Duct Kit (Hot Side) #1439: same as the Duct Hood, this kit also includes 2 x 25-feet of 6-inch insulated (R-6) flex ducting. Remote Display #1603: lets you place the digital panel wherever you want, whether inside or outside the cellar. Includes 10 feet of wiring. Bottle Probe #1434: this remote thermostat with a 10-foot cord overrides the thermostat on the face of the cooling unit, and allows it to monitor air or liquid temperatures at various locations inside the cellar. Extension cords available in 25-foot (#1780) and 50-foot (#1781) lengths. Rear Condensate Drain Line plus Heating Element are included as standard equipment. Power Cord Modification #1098: normally the cord exits from the rear of the cooling unit, which generally is outside the cellar; this modification moves the cord to the front of the cooling unit, so that it can be plugged into an outlet inside the cellar. Mounting Clips #1095: attached to the front of CellarPro 1800 Series cooling units, these clips are designed to be bolted to the ceiling inside the wine cabinet / cellar. How cold can the temperature be where the cooling unit is installed? How do I choose between top exhaust versus rear exhaust? What about the fresh air intake? The fresh air intake will always come from the rear of the cooling unit, and must pull air from OUTSIDE the wine cellar space - it must never be installed to pull air from inside the cellar. On 1800 Series cooling units, the hot air exhaust can exit from the top or the rear. Choose whichever configuration directs the exhaust to a space that is sufficiently large to accept the exhausted air, as long as the exhaust goes OUTSIDE the cellar and will NOT intermingle with the fresh air intake. If you plan to duct the hot side of the cooling unit, then the hot air will need to exhaust from the rear. Can the cooling unit be located in a remote location and ducted to/from the wine cellar? 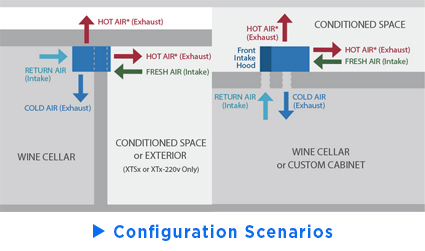 A: These cooling units can be installed above the wine cellar when used with our front intake hood. Does the unit need to be installed through the wall, or can I install the entire unit inside the cellar? A: These cooling units can be installed completely inside the wine cellar when used with our rear duct kit (P/N 1439), which allows rear supply and return airflows from a temperature controlled environment OUTSIDE the cellar to be ducted (with insulated ducting to minimize heat transfer inside the cellar) up to 100 equivalent feet (50 feet per duct). What if I don't have sufficient space behind the cooling unit for the hot air exhaust to dissipate? A: The rear of the cooling units can be ducted to another location by using our rear duct kit (P/N 1439), which allows rear supply and return airflows from a temperature controlled environment OUTSIDE the cellar to be ducted up to 100 equivalent feet (50 feet per duct). A: First, the background. Unlike our competitors, we build our cooling units with precision expansion valves, not cap tubes, which means that our cooling units aren't limited to a 30°F differential between the desired cellar temperature and the ambient temperature. Cooling systems with expansion valves are much more precise than cap tubes, and much more sensitive to low voltage conditions, which is why our units require dedicated circuits. When we say "dedicated circuit", we mean that the circuit shouldn't have any items that require heavy draws of electricity - eg other appliances, vacuum cleaners, big-screen TVs, blow-dryers - on the same circuit as the cooling unit. Lighting, computers or other low-draw items shouldn't be a problem on the same circuit. A: If you are using the cooling unit in a sealed cabinet, you probably don't need the drain line. If you are using the cooling unit in a walk-in room, we recommend the drain line, which can be drained inside (bottom) or outside (rear) the room. Choose the 100W heating element to reduce drainage as it helps to burns off excess condensate before it reaches the drain line.